A fire extinguisher should be among the necessities you keep in your vehicle. Technology has advanced to make cars lighter, faster, and more environmentally-friendly. The trade-off, however, is that cars are now made with materials that are more flammable than they used to be. Both the flammable liquids and the plastics used to make cars today allow fires to burn stronger and longer. There are ways that you can prevent a car fire or suppress one if it happens. As long as you are prepared with the proper knowledge and fire suppressants, you stand a greater chance of saving your vehicle. Taking preventative steps to ensure that your car is safe from a car fire is a great practice that all drivers should take the time to do. 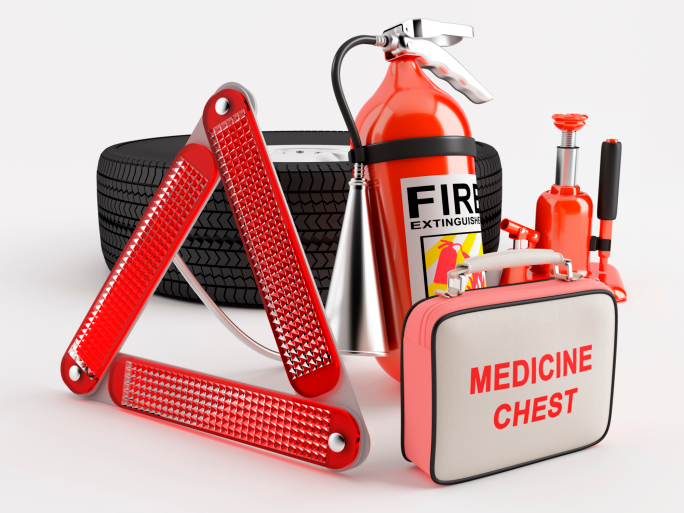 First, you want to make sure that you have a fire extinguisher within reach in your car. Just as important, make sure that you do not have any flammable liquids inside your car, like extra gasoline. Not only is carrying around extra gasoline a fire hazard, the gasoline fumes are also potentially life threatening. After you’ve secured the inside of your vehicle, check the engine to make sure that all parts are functional and up to date. If you need to install aftermarket parts, take them to a mechanic to make sure that they are installed correctly. A poorly installed aftermarket part can be the cause of a car fire. If the worst happens and you find yourself dealing with a car fire, there are steps that you can take to put the fire out effectively and safely. Grab your fire extinguisher and stand at a 45-degree angle to the fire. This keeps you a safe distance from the bumpers and other pressurized components that can explode from the car when overheated. Aim at the base of the fire to put it out more effectively. If the fire spreads or if you can’t open the hood, call 911 immediately! After you’ve safely extinguished the fire, check your vehicle for other potentially flammable items and remove them. You may want to disconnect your battery if you feel it is safe to do so, since the battery can continue to keep fuel flowing with an electronic fuel pump. If you had a small interior fire, like a fire on the upholstery from a dropped cigarette, then your car should be safe to drive. However, if you experienced an engine fire, you should have your car towed to a mechanic for maintenance before driving. Keep your vehicle safe. Fireline can help. This entry was posted on Friday, December 11th, 2015 at 2:43 am. Both comments and pings are currently closed.